I think what's happening is the B3 lawsuit has tipped off other business partners of Henry's that he may have been sucking money out of his business ventures to fund his campaign. This suit is a breach of contract lawsuit and was filed just yesterday. Stay tuned, I hope to post the suit in a few minutes. 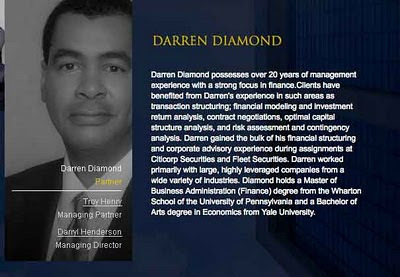 Darren A. Diamond Vs. Troy A. Henry Consulting, LLC. Henry Consulting was supposed to buy Diamond out of the company for $1,067,394. HC never paid that amount, and now Diamond is alleging that Henry has diverted the company's assets into his mayoral campaign. If Henry Consulting is worth so much (see this suit) and does so much management consulting work for so many major corporations (see this morning’s Times Picayune bio), how is it possible that Henry Consulting qualifies for certification as a “disadvantaged” business enterprise by the City? * Why isn’t the DBE program geared toward helping struggling businesses which actually need a hand up instead of giving City contracts away to rich guys who use political connections to get their kids Tulane scholarships? Can you tell us who filed the suit? I want to see if this is legitimate or if this is a political set-up lawsuit which have unfortunately been very common place in Orleans & Jefferson Parish. This is legitmate, it's Henry's business partner of 15 years. If you want to see who filed the suit, check out the website of Henry Consulting and see them both standing together. Diamond and Henry. Friends for over 20 years. What lawyers are involved on both sides? This is the more important question to ask. Who are the lawyers backing or who have they contributed too?